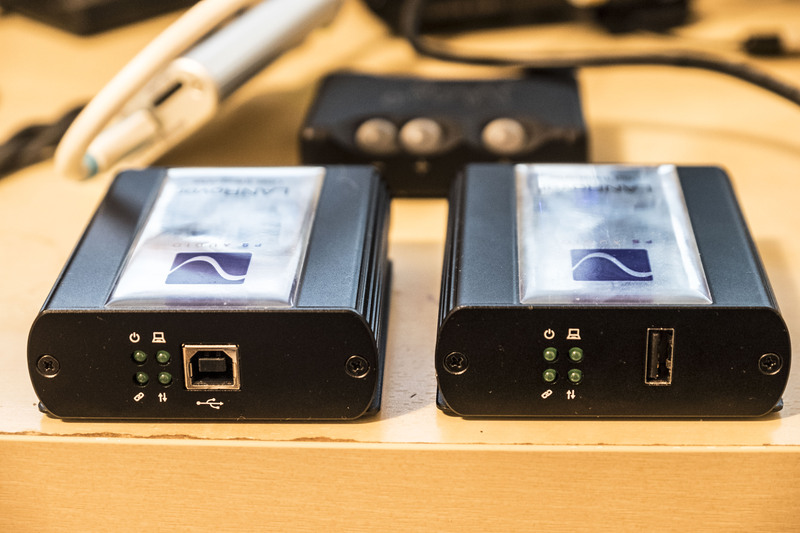 I’ve reviewed quite a few USB conditioners/regenerators and their variants in the past. 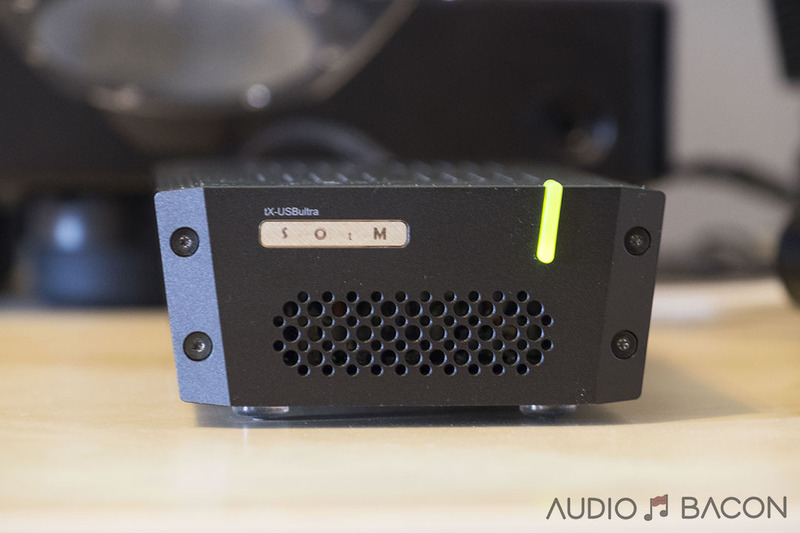 Their job is to filter noise and reconstruct an accurate and jitter-free signal for your DAC. Many of them apply their own sound signature, which isn’t a bad thing, as long as it does its job of phase correction and noise reduction. When SOtM announced their new USB conditioner, the price and size gave me pause. The SOtM tX-USBultra is the largest (106 mm x 48 mm x 227 mm) and priciest ($990 base) USB conditioner I’ve ever reviewed. It’s composed of SOtM’s new superclock sCLK-EX ($700), which is undoubtedly one of the world’s best clocks, and I believe a portion of their tX-USBhub. For all the technical details please take a look here. I could go into features and functionality but I believe I could provide more value by going straight into the setup and sound quality. 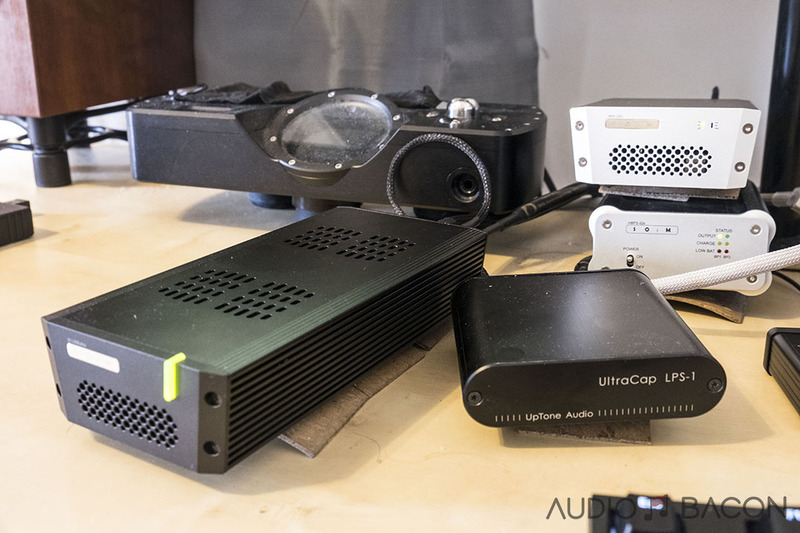 Over the course of a few weeks, I’ve used a variety of headphones/speakers and components in order to optimize the system and grasp the overarching benefits of the tX-USBultra. When I first received the SOtM tX-USBultra, it sounded quite abrasive and unbearable. SOtM recommends a minimum of 50-100 hours of burn-in. However, even after burn-in, the tX-USBultra sounded worse than a direct connection to the SOtM sMS-200. After powering it with the SOtM mBPS-d2s I noticed a significant improvement but still a bit cloudy, flat, and looser bass response. 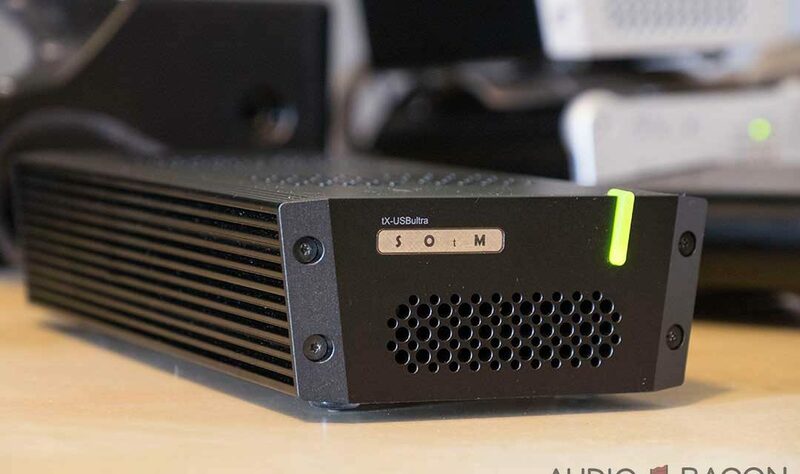 With the UpTone Audio UltraCap LPS-1, the benefits of the SOtM tX-USBultra were finally realized. With the lower phase/amplitude distortion, I was able to get much better image stability, tighter bass control, and an enormous soundstage. High bandwidth and low output impedance is the name of the game and the LPS-1 is one damn versatile and “affordable” linear power supply. At a price of $990 for the standard and $1,200 for the optional master clock, it is quite an outlay for many audiophiles. With the mandatory investment of a quality linear power supply…you’re looking at a $1,500 minimum cost. Not to mention you’ll need TWO high quality USB cables (can’t use short adapters). So now we’re at an eye-watering $2,500. Your Paypal account should be quivering uncontrollably at this point. That’s almost $3,700 in components! Rationally speaking, I don’t think any USB regenerator/conditioner could offer performance that could merit this much of an investment. Luckily we audiophiles think with our hearts and ears and not with the balance of our checking accounts. I recommend Blispay, no payment/interest for 6 months on things you need. Yeah, I’m a monster. You’re welcome. 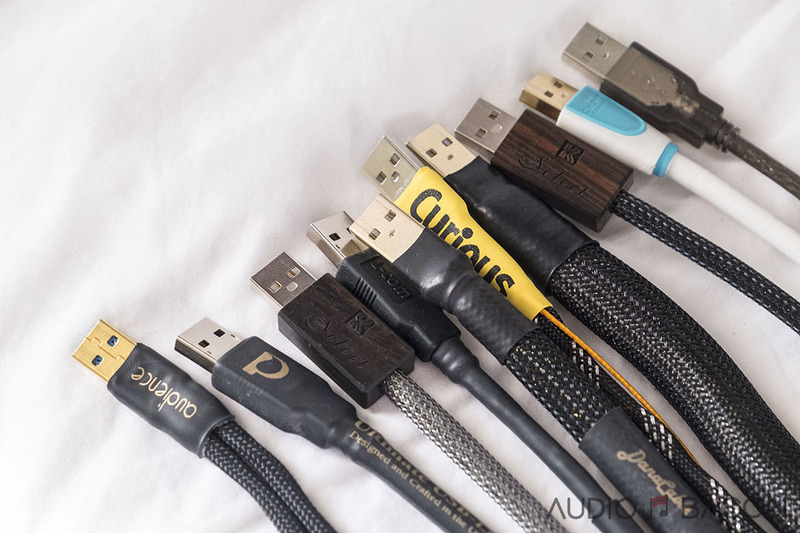 Unlike ethernet cables (which I’ll cover in a future review), I’ve found that many USB cables perform well and for the most part are respective of their price point. Even some generics were acceptable to my ears (gasp). 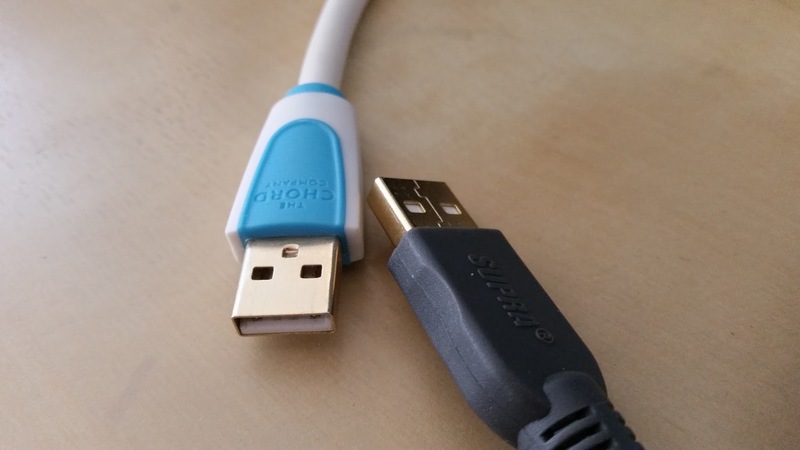 If you aren’t ignorant or using your audiophile USB cable on your printer, you’ll know that USB cables could improve the sound dramatically. Whether they’re worth the asking price, that’s another story. 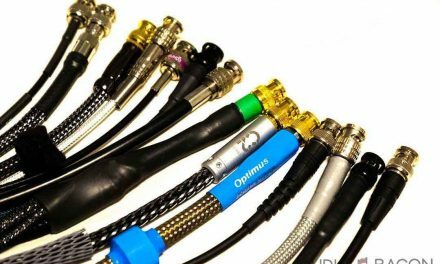 These listed cables provide exceptional clarity, detail, dynamics, and layering. They were also the most holographic sounding of the bunch. First I want to go over the inherent sonic qualities of each cable to provide a good baseline before the mix-n-match experiment on the tX. Probably the most detailed and resolving USB cable of the bunch. Outstanding resolution. The most natural sounding cable of the bunch. Excellent tone and timbre. A thin but tight low-end. Lacks slam. As mentioned, none of the cables are perfect and you kinda wish they could just mate with one another. No worries, the tX-USBultra will help facilitate the creation of this love child. Since the tX requires two cables, I experimented with a few permutations. During my initial listening, I would say the output USB cable from the tX to the Chord DAVE accounted for 80% of the sound. Generally it’s like mixing blue and yellow paint, you’d expect green. Mix two cables with known sonic characteristics and the expectation would align sonically, in this case proportionally 80/20 for output/input. When swapping extremely different sounding USB cables at the input, it doesn’t have huge effect on the final output, but some. However, that doesn’t necessarily mean that the “better” cable is placed at the output. For example, I’ve found having the $1,250 Clarity Cable Natural USB at the input of the tX and the $100 Chord Company Silver Plus USB at the output sounded better than the other way around. 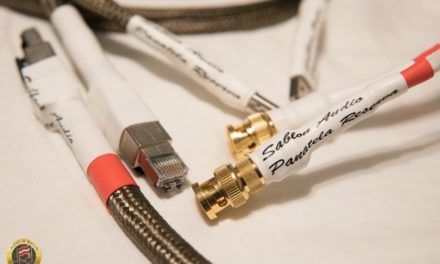 When the ultra smooth and less-detailed Chord Silver Plus cable was placed at the input, the Clarity Cable wasn’t provided enough information to work with and the sound lacked detail and texture. My gut says to put the most detailed cable at the input to provide the tX with a full picture before regeneration. Makes sense. 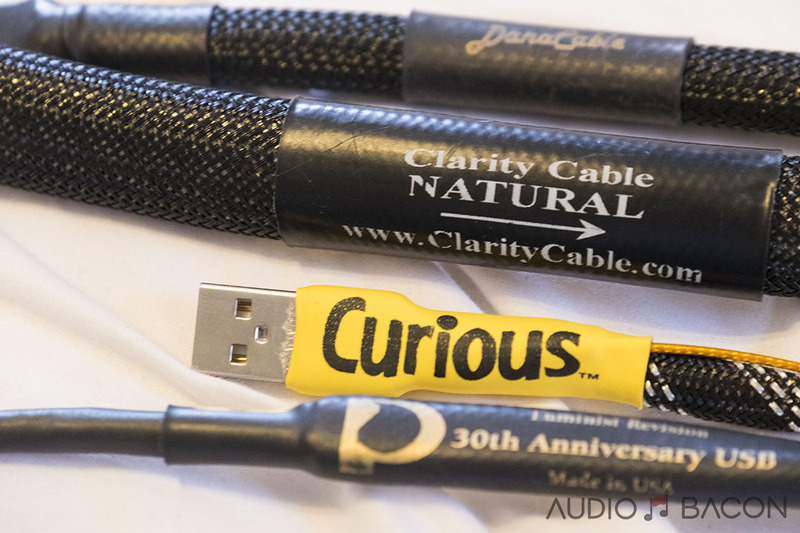 The Clarity Cable Natural USB was fantastic for classical, orchestral, some rock, and acoustic music. However for voices, it just wasn’t smooth enough for my tastes. The Danacable USB had the most natural tone and timbre. It lacks the clarity and resolution, but just sounds more like music. So as far as USB for the tX-USBultra, it has been the “base ingredient” in my listening. It sounds organic and complements nearly all the cables, including the Kimber (silver) and Curious USB. After days of listening, I suspect the best combination would be to have the Danacable USB at the output and either another Danacable or PAD 30th/Clarity Cable Natural at the input of the tX-USBultra. I couldn’t try this combination because there was a capacitance problem with having the Danacable USB at the output which caused an enormous amount of distortion. I’m currently in talks with Danacable for a solution (UPDATE: If you’re going to use the Danacable on the output, ask Danacable to shorten the cable so that it has a lower capacitance and will be easier to drive). I think it really comes down to finding the right balance for your ears. Personally, I would trade resolution and soundstage for a bit more warmth and texture. For that reason (outside of classical) I’ve stuck with the PAD 30th at the output and Danacable at the input for the rest of this review. Both the Danacable and PAD 30th have proper timbre for instruments and the tX combines their qualities into something that sounds too real to be coming out of speakers. This combination essentially takes the best parts of both cables in nearly the right proportions. I still notice this slight brightness which could be due to the power cable used for the LPS-1. I didn’t have a Sonore DC-4 for the review but suspect it’ll mitigate that issue. My assumption was based simply on the fact that this pitchiness doesn’t exist with USB cables individually or with the mBPS-d2s or even stock power supply. I also remember this problem from the setup with the microRendu. For reviews, I like playing files directly from server (housed in my BRIX server on a NVMe SSD drive). This way, it completely removes the network from the equation. The connection from the server to the sMS-200 is bridged so it doesn’t even hit a noisy switch. I’ve done enough comparisons between local files and lossless Tidal streams to accept that the sound will be flatter and less dynamic without a proper network infrastructure in place. That said, the tX-USBultra does wonders for streamed music. I never thought a USB regenerator could correct the sound at this level but it does a wonderful job. When A/B’ing with and without the tX…the improvements cannot be understated. So much so, I may consider using more streamed music for testing in the future. Simply put, if your music library is mostly through these music streaming providers, I would consider the tX-USBultra. Like always I try to cover all genres of music. I’ve actually written notes for all these recordings but it quickly became overwhelming. I’ve condensed them into a summary which I’ll talk about in the next section. But I wonder if you had the chance to compare it to the Mutec MC-3+ Smart Clock USB, which is in the same price range. It’s maybe a little bit hard to compare, since it only has one bidirectional USB input/output but offers a lot more flexibility (different inputs/outputs) and is externaly reclocked to rubidium/caesium clocks. I haven’t had the chance to compare it to the Mutec although if you have one to send in let me know. Rubidium atomic clocks have good long term stability but poor short term (which isn’t the best for audio). and to be honest I don’t fully understand how this remote reclocking works… Hoped you could tell more about how it works. Just read a few reviews / forum post where people were drooling how this is the reclocker to beat. I’ll have to cover this in-depth with another post but the idea is that the bits are ordered in a timely fashion as they’re streamed from your server. The clocks used on your motherboard, ethernet cards, USB hubs, etc require difference frequencies and have various short and long term performance/stability characteristics. Bits will be disoriented along the path and cause sonic degradation. After hearing the tX, I could tell you the noise is quite substantial. It’s best to have all of these devices sync to a reference clock to reduce phase noise along the chain. The more accurate and stable this clock is, the more honest and humanistic your music will sound. Hello Jay, Thanks for yet another great review! I was wondering if you would also be reviewing the new ISO-Regen from Uptone Audio? It would be quite interesting to see how it stacks up and (fingers crosses) if it can match or exceed this unit’s performance. Hey Mike, that would be interesting indeed. I’m curious as well. I’ll try to get a hold of one soon. Will keep you posted. A wonderful review once a gain, Jay! Your site has become a true audiophile destination. I am always eager to know what’s next from you. A couple of comments…just like you, balance is everything to me. Without it, it’s hard to move forward because all I can think of is what’s missing or what there is too much of. I, too, am very sensitive to an overly energetic treble (brightness) and I suspect at least one source of your brightness may be your NVMe SSD drive. Such a drive singlehandedly forced me to move away from a certain Mac Mini that had such a drive. Another Mac Mini I have on hand that runs its OS off an SD card, in comparison, sounds much much less fatiguing. SSDs in general emit a brightness that is largely responsible for the glare that I equate with bad digital, and NVMe drives, in my own experience, are the worst of the lot. Look at their current draw and you’ll find that most NVMe drives draw close to 2A at their peak! Compare that against something like a compact flash card which draws in the order of 2500% less current (which results in much less noise kicked back into the ground plane) and you begin to appreciate why there is a greater relative ease and calmness with such drives. Anyway, the point of this is that you can go to great lengths by mixing and matching USB cables to mitigate this annoying treble energy (at the expense of detail resolution) when the better solution all along maybe to address issues within your server. Another advantage I have found with superior clocking is the removal of glare. Having several of SOtM’s Ultra devices on hand, as I have combined an sMS-200ultra in series with a tX-USBultra and dX-USB HD Ultra, this glare that we are both sensitive to simply lessens and lessens. If every clock in our signal path, from the router to the DAC, were at the level of SOtM’s new super clock, I suspect, we wouldn’t need so many reparative or regenerative devices to follow the server and that more of us would be writing poetry more regularly. The superclock in the tX changes the game. None of the USB regens I’ve heard so far even compare. Obviously, it’s also much pricier than most options (just the clock is $700). What do you think about curius usb, is it close to that kings? What are pros nad cons. The Curious USB has the tonality of the Clarity Cable and I have no hesitation recommending it. The kings have better coherence and timbre but you get an enormous amount of fidelity for the money with the Curious. It’s very holographic, detailed, black as night, with plenty of textures and slam. It’s the best sounding cable I’ve heard so far under $700. That said, their “portable” options for Hugo/Mojo are an absolute steal. Hello Jay, i enjoyed your review a lot. I own a microrendu with lps-1. I am wondering if this product is likely to make a difference in my setup. Thanks. Anywhere you’re using an ethernet cable for your music, it’ll improve the SQ (presuming you’re just using a generic). I am using AQ Forest Ethernet cables along with a TP-Link Gigabit Ethernet Media Converter to clean up the signal from my router. I already have a sms-200, stream from my NUC Roon server. is it favorable to replace sms-200 with a TX connect to my NUC by USB ? As I can’t afford sms-200 & TX together, and I also want to make the chain simple while good in SQ. Seems using TX still need a high quality USB output from PC or streamer in order to win SQ of sms-200. By the way, the upgrade cost from sms-200 to sms-200 Ultra is so close to the price of an TX, do you think sms-200 + TX, or sms-200 Ultra alone, will gives better SQ ? HI thanks for the review! I already own the Sms -200 so your review was very useful. Just wanted to know what you chain at the beginning was up your BRIX server? In the above I upgraded to the generic Cat 7 lan cable from a generic Cat 5 cable and was really impressed with the improvement. The is the point of my post. I want to know if you should use a better cable from your router/switch to you server IF it is bridged (like your BRIX is) ? I have a SOtM CAT7 + iSO-CAT6 + black cable from the modem to the router with a SOtM sPS-500 + Y splitter to power both modem and router. The improvements were dramatic. They’re still distinguishable from local files but no more digital edge and harshness. This setup brings in coherence and warmth. I would still use local files for critical listening but streamed music sounds superb with the proper cables and power supply in place. Thanks Jay, appreciate the reply. Looks like I’ll have to get a better power supply for my all in one modem/outer as well a better lan cable from my modem/router to my Roon ROCK Nuc music server. Btw, I don’t stream any music, just local files from my Nuc. Today as way of quick test I plugged the current modem/router wallwart in to a power HIFi strip (that I bought nearly 20 years ago) and indeed got a really good improvement. Oh btw from my bridged music server (nic i7i3) to my Sotm sMS 200 I recently upgraded to a 2m Ghent Audio ethernet cable (http://www.ghentaudio.com/part/et02.html). Really made a big difference compared to the generic cat lan 7 cable. Total cost including DHL delivery from China to Sweden was $100. If you have to choose one between PS audio lanrover and Sotm tx-usbultra, what is your choice? They kinda serve different purposes. LANRover allows you to have your server/PC in a remote location. Can’t do that with the tX-USBultra. PS Audio = smoother and more analog. SOtM = Quieter, more resolution, and air. Jay, DanaCable gave me a price for a 3 ft TruStream USB Cable. Do you think this is short enough to avoid the capacitance problem? I can’t really say. I know a 1.5m didn’t work and the two cables I have are about a foot and the other being around 8 inches (I thought they were at least 2 ft but I was mistaken). I would tell Danacable about what you’re trying to do and hopefully, they’ve come up with a solution where they don’t have to shorten the cable so much. Ok thanks. Waiting to hear from them. So did the 1 foot and 8″ cables work? I’d look for an alternative to the Dana as well, giving a similar SQ. The PAD 30th Anniversary at $1500 is a bit much, but PAD does have a copper Ultimate USB cable for $900. Any experience or comment about this one? FYI based on your reviews of the tX and the ISO, I’ve ordered these units and will put together a setup like yours. Thus the questions about the Dana.